Most people have a lot of grace, and everything's fine… Until it's not. I spoke with a lot of people that have a lot of patience for their real estate agent but we can't put up with everything and at some point, enough is enough. Sure, people can miss an appointment, forget to call you back, or make a mistake from time to time but when it happens consistently and communication is not there, it's time to pull the plug. 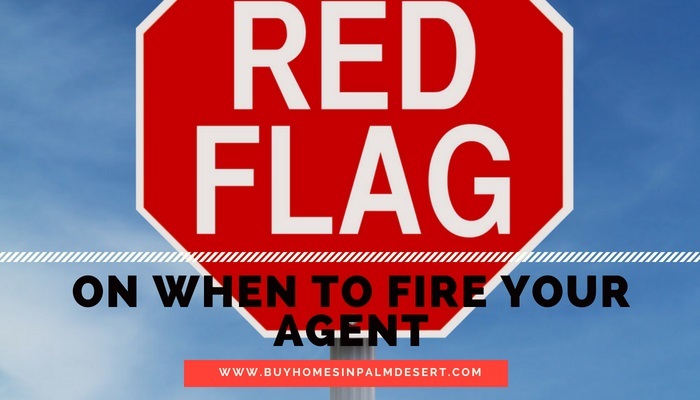 If you're wondering whether or not to fire your agent, here are a few telltale signs that it might be time to move on. They consistently break their word. If they told you they would teach you at a certain time and have only missed her that once, chances are it's a mistake that can easily be overlooked. But if by the third or fourth time they've rescheduled, not contacted you to reschedule, or simply missed appointments, there's something more going on. Lack of time management is definitely something that can be frustrating to clients and possibly detrimental to a home sale. If you're finding inconsistencies with their communication or they've told you one thing but it's really another, it's time to cut ties. When your agent really doesn't "get" you. If your buyer's agent showing you homes that are either out of your price range or have nothing in common with your search criteria, it's time to have a conversation first. Ask them if they could be more consistent with the type of home you are looking for. Ask them why they keep showing you homes that just don't work for you. It might be a simple miscommunication but if it keeps happening, it's time to find it agent really understands what you need. You can never get a hold of them. If you find yourself frustrated because you've called and left messages, texted, or even dropped by the office and left a note without any communication or response, they clearly have better things to do than sell you a house. Even though most listing contracts are six months, if the agent is not doing their job, it may be time to talk to their managing broker. Each agent is actually representing their broker and if the broker's name is on the contract and they are not doing a good job, that broker is the one that pays. You feel like you are always in the wrong. If every time you bring up issues of concern they throw it back on you or make you feel like you are the one to blame or you're at fault for not being available, there needs to be a reality check here. You are the client. As real estate agents we are working for you and if something doesn't work right, it's best to find a win-win for both rather than to accuse the client of miscommunication. Try to find equal ground and if they still consistently play the blame game, that's nothing you should deal with. So how do you fire your agent? Start by creating a paper trail. While this is in a situation that will go to court, by any means, having a little bit of documentation as proof can set you up for a better result. If you've tried to talk with them multiple times and you're just not getting anywhere, make a list of different areas of concern. It also depends on where in the process you are; if you're in the middle of a transaction, you may not be able to fire your agent, but you could talk to their managing broker for them to take over or transfer the transaction to someone else. If you are simply listing your property and haven't accepted an offer or still in the process of looking for a home, talk about your concerns and go with your gut feeling. If they really are not seeing eye to eye with you, it's time to move on. A phone call is usually the most effective. This is probably not something that should be handled over text or email but in person or over the phone is the best way to "break up" with your agent. Try not to burn a bridge but just be clear and concise and if they fly off the handle, that is not your problem. If you choose to fire your agent in person, be sure to select the best location for this type of conversation. A public place rather than the agent's office is usually the best option. And remember, be professional. You are ending a relationship for career centered reasons, not personal reasons and as long as you can walk away from the meeting feeling confident you've done all you can to be as professional and clear-cut as possible, you can keep your head held high as you search for a new real estate agent. If you have questions concerning your agent or would just like to have some answers to popular real estate questions into the search for homes throughout the Palm Desert area give us a call at any time.